I’m Investing In Bitcoin: Watch Me Buy, Send, Sell And Cash Out! Obviously this is quite different to the usual internet marketing stuff I post about on this blog. Specifically, I’m putting a very small percentage of my personal investment portfolio in bitcoin and holding that for the long term (i.e. years, not weeks or months). You might call this a punt. I’m quite prepared to wake up one day and learn that Bitcoin has disappeared off the face of the planet and my coins are worth nothing. If so that’s fine – I won’t lose sleep and my lifestyle won’t be affected because I’m not betting “the house” (which I wouldn’t do on anything anyway). On the other hand, maybe bitcoin won’t go to zero and I personally believe there is a good probability that its price will experience a very large rise over the longer term. It’s a currency which is created and held electronically. It’s decentralised meaning that unlike normal currencies such as dollars, euros and yen it isn’t controlled by any central bank, government or group of individuals. It also has very low transaction fees which is one of its major advantages. Here’s a reasonable helpful beginner’s guide on Coindesk’s website: http://www.coindesk.com/information (all links in this post open in a new window). This is purely my opinion and nothing more. This is not financial advice and I’m not qualified to give any. Do your own research and take responsibility for your own investments. First of all I’d like to say a BIG THANK YOU if you voted, I’ve always found that for some reason only a minority of people bother to participate in surveys like these so I appreciate it if you took the time! How many websites do you need? One for each product? Where does your blog and squeeze page fit in? Was this helpful? As always all views positive, negative, indifferent are welcome – please do drop a quick message below in the comments section 🙂 All the best, Rob. 1) This is another nail in the coffin of the Warrior Forum (completely separate and independent from WarriorPlus), my blog post The Death Of The Warrior Forum from last year explains more if you’re interested. 2) The changes from Mike is a great reminder that launching low priced products remains one of the fastest and most powerful ways to build your email list. And WarriorPlus.com is an EXCELLENT place to get started and learn the ropes. In the last 3 weeks I’ve made well over 1,000 sales using this exact formula and multiple thousands more over the past few years. It’s that not hard and as always you’ll surprise yourself at just how much you are capable of *IF* you break it down and take it step by step. If you feel completely intimidated by the above then start with a free offer. This could be a 1 page cheat sheet, resource list (e.g., cool WordPress plugins or graphics tools), or even be some rebranded Private Label Rights. 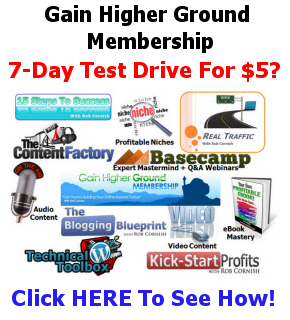 You won’t get much traffic with a free offer because there’s no commission available to attract affiliates. But it’ll help you get started and learn the ropes. It’s a simple, REAL way to get started building a monthly online income. Even gurus with $10,000+ priced products know the power of this and launch budget “list building” products too. I have premium priced offers and do the same. Any questions, hit reply and if there are common ones I’ll see if I can do a follow up newsletter to address them. If everyone’s talking about something it MUST be worth knowing, right? But this doesn’t just deliver a huge bolt of social proof, it also implies that this diet must be something new. So by subtly implying the information is different/fresh/new we handle this objection right upfront. It’s been 7 days since I upgraded to Windows 10. Here’s a short video with my thoughts on it plus a warning about something you might like to consider after upgrading.